Adam Hunt of Willimantic sands a bat down to the desired size at Dove Tail Bats in Shirley. SHIRLEY, Maine — The pictures on Paul Lancisi’s cellphone are a testimony to his love of baseball and his continuing connection to the game. Newly signed Philadelphia Phillies outfielder Bryce Harper, 2016 National League MVP Kris Bryant of the Chicago Cubs, Chicago White Sox infielder Yoan Moncada, and rising prospects Pete Alonzo and Jeff McNeil — last week’s opening-day starters at first base and third base for the New York Mets — all are on display. So, too, are former Heisman Trophy winner and current minor leaguer Tim Tebow and country music superstar Garth Brooks, who’s been known to work out with major-league teams during spring training, including this year with the Pittsburgh Pirates. At the time, all were swinging Dove Tail Bats, crafted by the namesake company owned by Lancisi and his wife Theresa next to their custom cabinetry shop along Route 15 south of Greenville. Dove Tail Bats has grown from modest beginnings in 2010 to one of approximately 35 bat manufacturers certified by Major League Baseball. 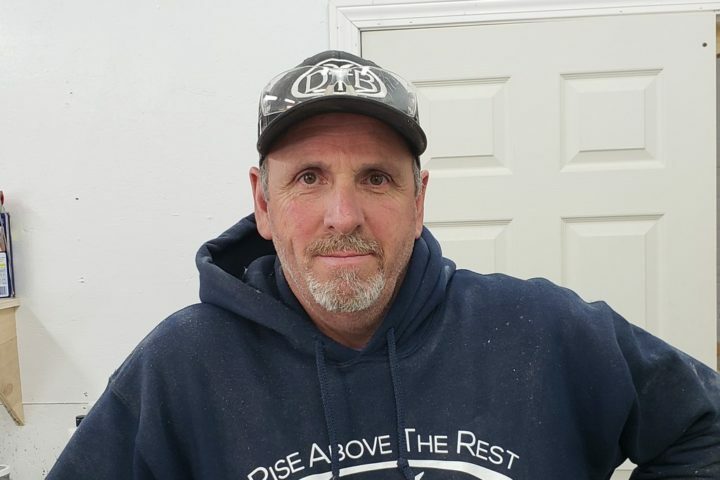 The 58-year-old Lancisi, a Massachusetts native who tried out for the Boston Red Sox in 1982, coached his son’s team at Foxcroft Academy in Dover-Foxcroft in the mid-2000s. Dove Tail Bats owner Paul Lancisi takes a break during a recent workday to talk about his baseball bat-making company in Shirley. He encouraged players to swing wood bats in practice because the smaller sweet spot of a wood bat’s barrel required more attention to batting detail than the aluminum bats used during games to generate hitting power. “My son [Nick] wanted to play at a higher level so we were going to big-box stores and buying bats, and they were just shattering,” Lancisi said. “I brought some back to the shop and did some moisture testing and realized it was old, degraded wood. When Lancisi subsequently learned that approximately 5,400 bats were broken during Major League Baseball games in both 2007 and 2008, it gave him an idea. 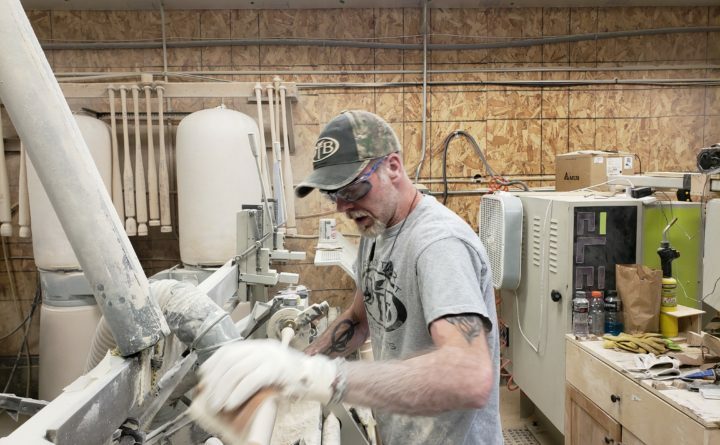 “I realized making bats could be a lucrative business and also could pick up the slack in the offseason of my cabinet company because we’re seasonal up here,” he said. Dove Tail Bats grew to produce 3,500 bats in 2014, its first year with MLB certification. Yasiel Puig, then with the Los Angeles Dodgers, was the first major leaguer to use one of the models. By 2015, Lancisi hired a sales representative with connections to the Kansas City Royals, and that led Dove Tail Bats to a competitive breakthrough. Royals first baseman Eric Hosmer started using the bats and his teammates soon followed — and Kansas City went on to win the World Series. That exposure led to even more exposure for the company, as Dove Tail Bats’ production doubled from 7,000 in 2015 to 14,000 in 2016 and to 28,000 in 2017. Eric Bean of Corinth watches as a computer numerical control lathe begins to form the handle of a bat. Last year produced similar production numbers, and Lancisi expects more than 30,000 bats to be sold this year in markets including the United States, Latin America, Australia, Taiwan and Japan. “And that’s only because of time and capacity, we’re having a banner year,” he said. “If we doubled again we could produce 60,000 and buy another kiln. That might happen, but then you need manpower. “When you go from 6,400 minor leaguers down to the 1,280 players in the majors they get weaned out pretty quickly, but we hope those select few that make it carry us with them and attribute some of that success to the product they’re using,” he said. Lancisi expects approximately 75 major leaguers to swing Dove Tail Bats this season. “Once you get a few players, now you start to get that trickle back down to the younger levels,” he said. Lancisi prefers Maine wood because the Northeast’s slower growth cycle makes for a denser bat than those made from the faster-growing wood of warmer locales. “Where we’re located we have the resources available, and that was one of my reasons for staying up here,” he said. Logs arrive by the tractor-trailer load at the mill for Lancisi and his 11 manufacturing employees — DTB also has seven salespeople — to transform into bats. First the logs are split and cut down into squared lengths before being kiln-dried for 14 days. Then they are rounded into billets and placed onto lathes to be custom-shaped into bats before being sanded down and painted. 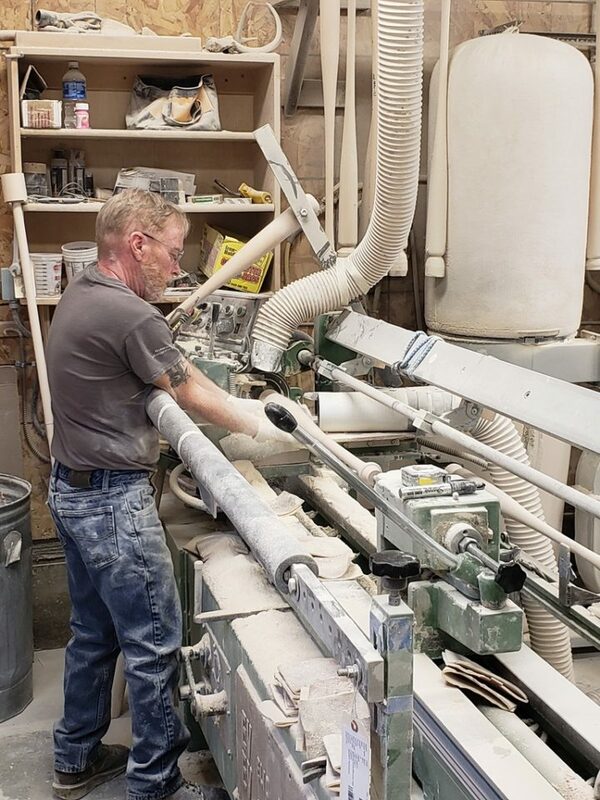 Tim LaPointe of Monson puts a bat through a sanding machine to bring it to its desired weight recently at Dove Tail Bats in Shirley. Maple began replacing ash as the wood of choice beginning in the 1990s because of its relative power-generating hardness compared to the more flexible ash and remains the most popular type of wood bat. 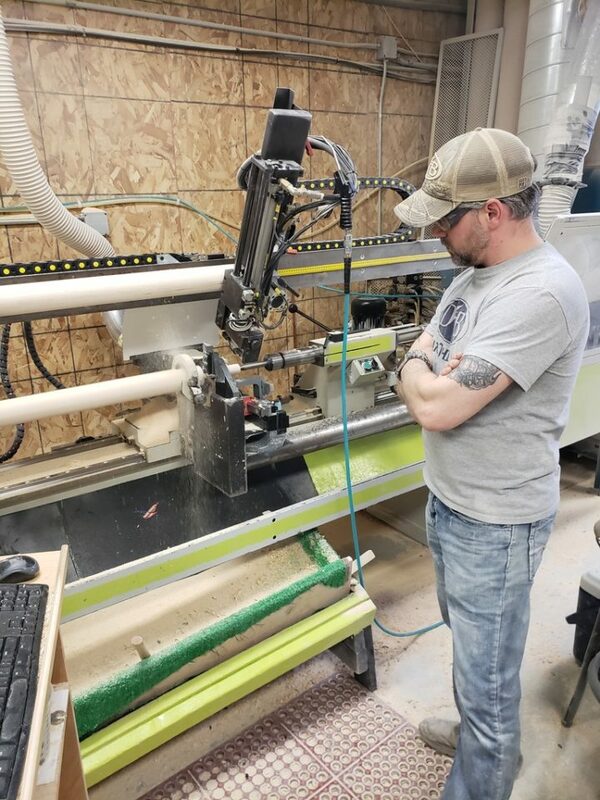 Lancisi said yellow birch, which he describes as just as hard as maple and as flexible as ash, is gaining momentum within the industry. He estimates that 65 to 70 percent of Dove Tail Bats now are made from yellow birch. Dove Tail Bats has expanded its offerings this year, adding fungo bats for coaches and BBCOR models with a carbon-fiber wrapped handle and wood barrel for younger hitters. Lancisi needs that variety — along with as many base hits and testimonials as his bats can generate from the players that use them — to thrive in an industry dominated by such long-established manufacturers as Louisville Slugger, Rawlings, Old Hickory and Marucci.